This is the letter I wrote to Random House regarding the book I will be talking about on an upcoming podcast. I’ve been asking for comments from them and in general women in the IT world, as well as a few of the more strong woman leaders like Laci Green who are trying to change perceptions in a male dominated world. And since thatstupidpodcast.com doesn’t really have a blog I decided to put this up here for now. And if you’d like to give me your opinion leave a comment or call me @ 480-STUPID-9 and leave a voice mail for me to play on the podcast in a few weeks. I’ve also called and left a message with an Associate Publicist at Random House in the hopes I’m able to at the very least get a comment from the publisher or at the best (in a dream world) have a sit down interview with the publisher and the book’s author and answer some real questions about why, while women are treated as second class would a female author of a children’s book in 2013 write and then publish a book that devalues women without hesitation. And with that I leave you with my letter. 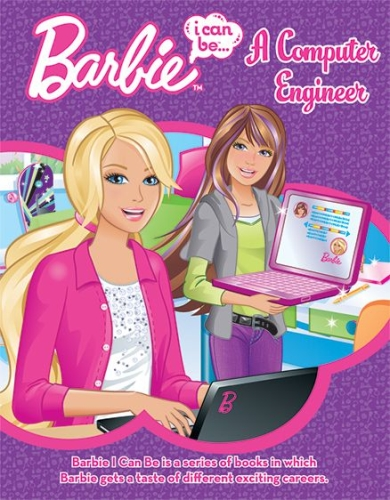 The book entitled I Can Be a Computer Engineer (Barbie) By Susan Marenco; illustrated by Random House is something I am planning on speaking about in a publication soon and would like to know if Random House has any comments about the book or its author. I host a newly formed weekly podcast over at thatstupidpodcast.com and one of the focal points of my new podcast is women in geek culture and how they tend to be treated as second class citizens. I’ve interviewed and given a platform to one such “geek girl” so far and after a friend was given your book (which I later purchased a copy of to see for myself) I was appalled at the way this book is expressing how women act and are treated in the world of technology. “Computer engineer” Barbie is designing a video game (so far so good) but when her sister asks to play it she laughs and says she’s only drawing the picture, and that she needs help from 2 boys to make it a real game. This means that girls can’t really code which enforces a horrible stereotype at a young age. Additionally it shows that a girl needs a boy to do anything of value. Her laptop then dies due to a virus and won’t boot up. She promptly kicks her sister out of the way, and sticks her USB drive into her sister’s laptop, which (shockingly to them) gets infected and crashes. She has no respect for the boundary her sister has offered to her (needing to complete her own assignment) and does what she wants regardless of potential consequence. She goes to class and asks the teacher for help, and the teacher tells her to take the hard drive out and plug it into the library computer to recover the data, which she tries but needs “Steven” to come to her rescue. “Steven” and the other dude then save all of her data, her sisters data, and write Barbie’s programming assignment for her. Again enforcing her inability (and therefor the inability of women) to fix her own computer problems. Barbie then takes the fixed computer home to her sister — taking full credit for fixing it, and hands in the programming assignment (that Steven wrote for her), ALSO taking full credit for it, and the teacher is so impressed she gives Barbie extra credit. So she didn’t learn from her mistake. She enforced the stereotype that girls can get boys to do their work for them and simply take the credit (or extra credit as the case were in this story) and no one need worry about who actually did the work since it’s obvious a girl couldn’t have done it by herself anyway. Did I get that about right? Is this what we want to teach young girls? When does the madness end? When do we stop enforcing invalid and horribly bias stereotypes that girls “just aren’t good enough” to compete with the boys when it comes to technology? I look forward to hearing from you. You may call or me personally to discuss this book and what it’s teaching the potential future for our engineering workforce.